It is our aim to search for new applications for our products and to increase the number of potential sales and installations therefore. One of many possible applications of heating technology includes the growth chambers for plants growing. There is a big potential, mainly due to the fact that we – thanks to above-standard activities of our design department – reached solution of programmable LED lighting, being one of just a few manufacturers all over the world. Thanks to our permanent activities we succeeded to get in touch with the head of the Technology Transfer Centre of the Mendel University in Brno. The continuous negotiations indicated the need of the university to test new methods of plants growing. From our side, there was a necessity of long-term collection of experience and non-complicated communication with the user, uncomplicated access to the work site and complete final report from tests. It was agreed for the device to be lent to the laboratories in Černá Pole for the period of nearly one year, with possibility of continuous access to the device and consultations with users. 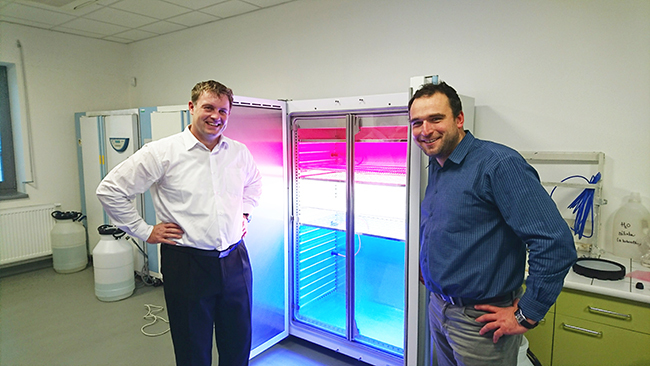 That means that there is currently running the testing operation of the Climacell 707 EVO device with special treatment of colour light LED sources for green plants growing. That was just the first step towards start of long-term co-operation with Mendel University, where we expect highly qualified feedback and collection of experience.